DES MOINES – Head Coach Dixie Wooten announced today that the Iowa Barnstormers have signed defensive back Robert Lewis to a contract. On Saturday, November 17 in Des Moines, Iowa, the Iowa Barnstormers held their annual Open Tryout. Over 30 athletes from across the country competed for a chance at making the 2019 Iowa Barnstormers roster. One of those hopefuls was Robert Lewis, a former Grand View Viking who impressed Coach Wooten and earned an invitation to training camp. 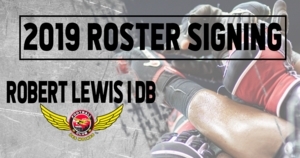 Lewis (6-0, 180, Grand View University) joins the Iowa Barnstormers for his rookie season in the Indoor Football League (IFL). Lewis spent three years at Grand View University in Des Moines where he earned honors as a two time All-Conference Defensive Player and as two-time All American Heart of America Defensive Player of the Year. With several talented athletes in attendance at the open tryout, Robert Lewis’s focus is what grabbed Coach Wooten’s attention. Coach Wooten has a history of signing talent from the team’s open tryouts and holds high expectations when it comes to how they perform at training camp. The Iowa Barnstormers home opener is scheduled for Saturday, March 9, 2019 at Wells Fargo Arena against the Green Bay Blizzard. Season Tickets are on sale for the 2019 season starting as low as $80 per seat. Don’t miss a minute of the action this season! For more information, call the Barnstormers at (515) 633-2255 or log on to www.theiowabarnstormers.com.